This is an online review of the DVD Baby Einstein, Numbers Nursery. With movie synopsis, cast, pictures, wallpapers, quotes, where to buy it and more. 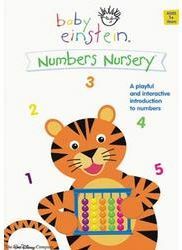 Numbers Nursery introduces babies and toddlers to the numbers 1 through 5 in a playful, interactive way that encourages them to join in and count out loud. Classical compositions by Hayden, Chopin, Strauss and Schubert--specially reorchestrated for little ears--accompany images of unique toys, adorable puppets and familiar real-world objects designed to surprise and delight little ones.